Bodhisattvas are beings who liberate themselves and others from the suffering and affliction of our world. They perfect they perfect themselves by giving to other, maintaining strict discipline, always being patient, working tirelessly, focusing their minds, and gaining wisdom. They make great vows that sustain sustain their efforts for measureless time-and we can all walk this same path. Infinite Compassion, Endless Wisdom presents a detailed picture of the bodhisattva: from the first step along the bodhisattva path all the way to its completion, as well sharing the lives of the great bodhisattvas that inspire us. Form the great thousand armed Avalokitesvara to the brilliant scholar Nagarjuna, Infinite Compassion, Endless Wisdom helps us learn of their vows, their practices, and how to follow their path. Infinite Compassion, Endless Wisdom: The Practice of the Bodhisattva Path presents a detailed introduction to the stages on the path to the Mahayana Buddhist ideal of liberating both the self and others as well as the history of the formation of different school of Buddhism, and accounts of the lives of the Buddha, bodhisattvas and lay devotees. The book beings by describing how the path should be approached, comparing the causes and conditions necessary for initiating spiritual development to the causes and conditions necessary for the intellectual formation required for professional success. 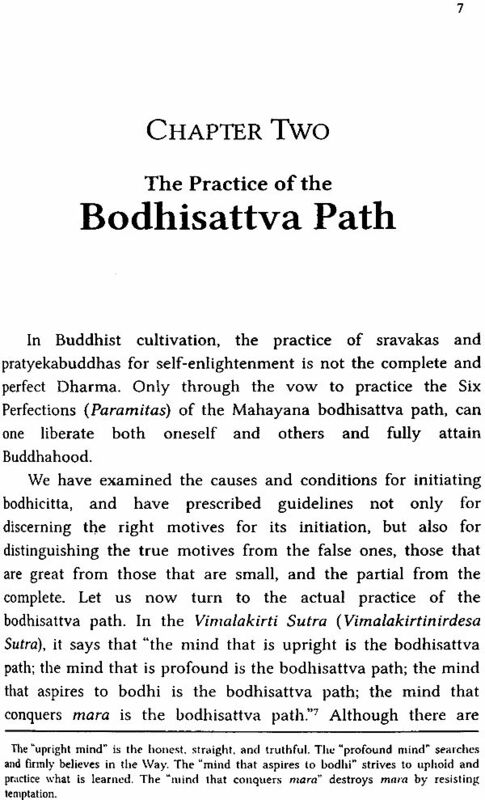 Once the proper orientation to the path has been established, the text states in “The Practice of the Boddhisattva Path” that there are infinite ways of practice on the bodhisattva path; all of these, however, are embodied in the Four Universal Vows, the Four Immeasurable States of Mind, the Four Means of Embracing and the Six Perfections, and the text describes these in detail. 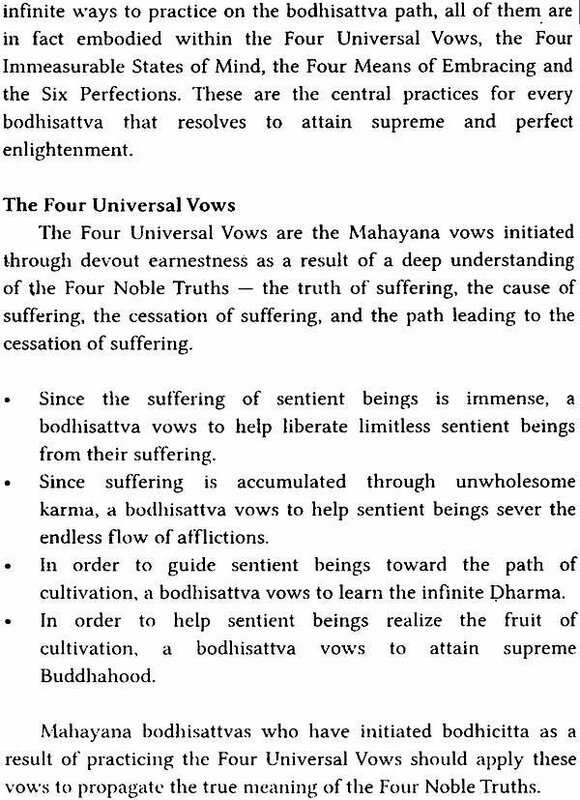 The third section, “The Stages of the Bodhisattva Path” is based on the stages of spiritual development that the Buddha himself experienced prior to enlightenment, as narrated in the jataka Tales, and describes the more than fifty levels before reaching complete attainment of Buddhahood. 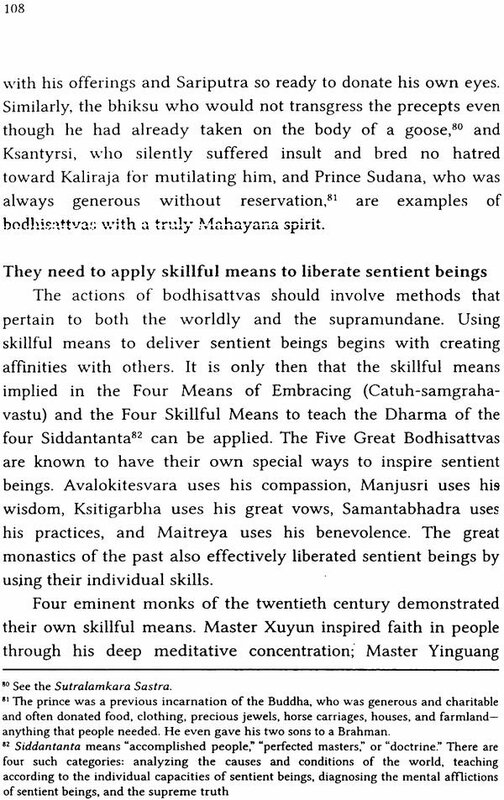 With this background established, the text then provides examples of five important bodhisattvas: Avalokitesvara Boddhisattva, Manjusri Bodhisattva, Samantabhadra Bodhisattva, Ksitigarbha Bodhisattva, and Maitreya Bodhisattva. 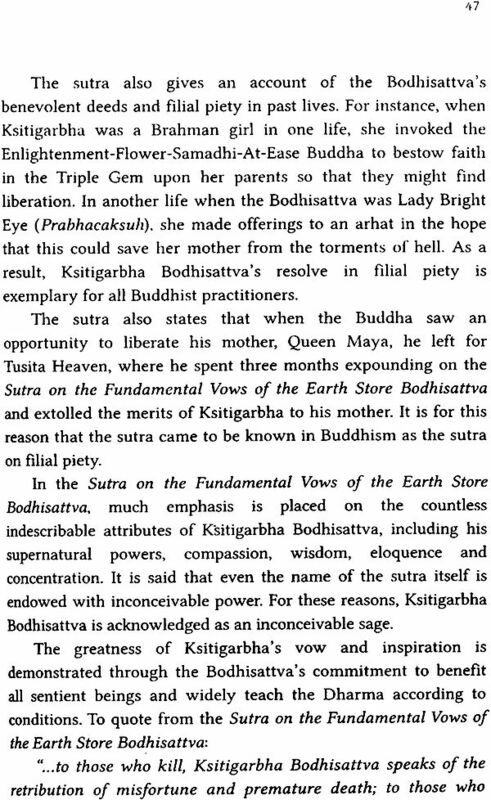 Any reader unfamiliar with these bodhisattvas will find a wealth of information about their significance in Buddhist traditions. 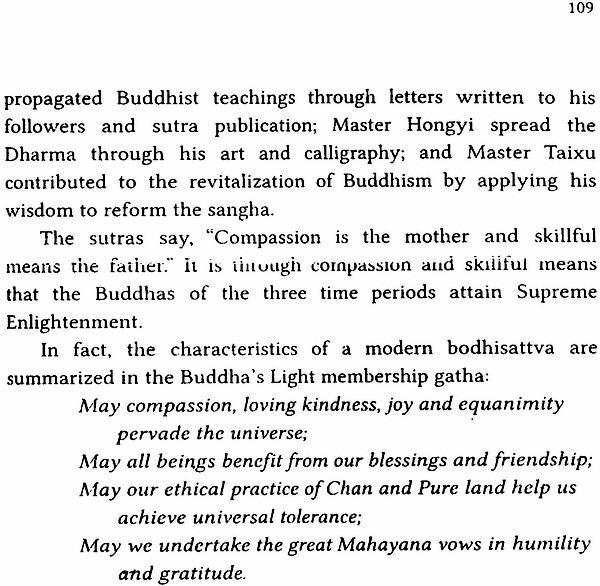 The text also provides biographies of spiritual leaders in the Mahayana Buddhist tradition. 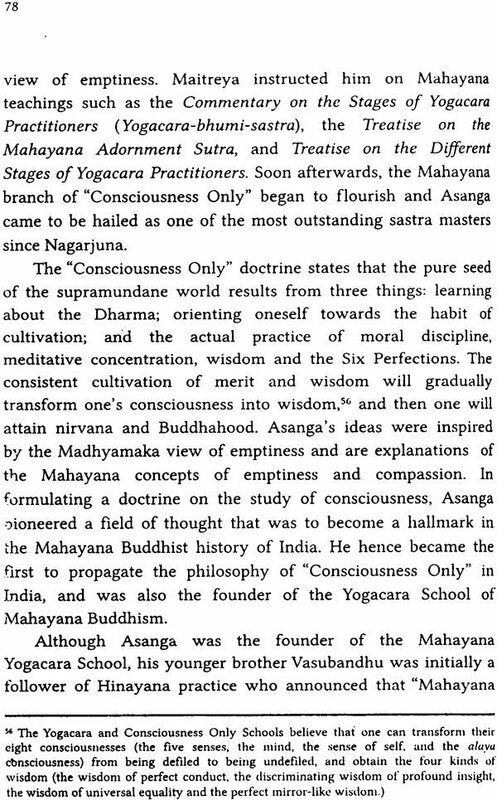 These include: Asvaghosa, who was also a Sanskrit poet, dramatist and musician; Nagarjuna,, a prolific scholar known as “The Patriarch of Eight Schools,” and also as the Patriarch of Esoteric Buddhism in Tibet; Aryadeva, who following in the footsteps of Nagarjuna, advanced the Mahayana teaching of emptiness. 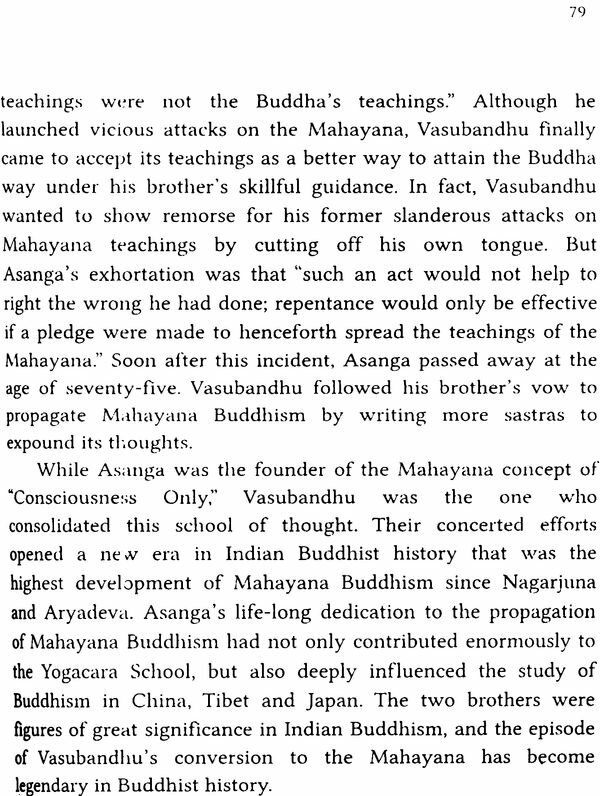 and voluntarily served in the military in order to persuade a king, and by extension his subjects, to convert to Buddhism; Asanga and Vasubandau, the two brothers who founded the “Consciousness Only’ School; Queen Srimala, wife of a king and an early proponent of Sunday Schools and of prenatal care; and Vimalakirti, whose eponymous sutra demonstrates that a lay devotee can be as enlightened as a monastic. 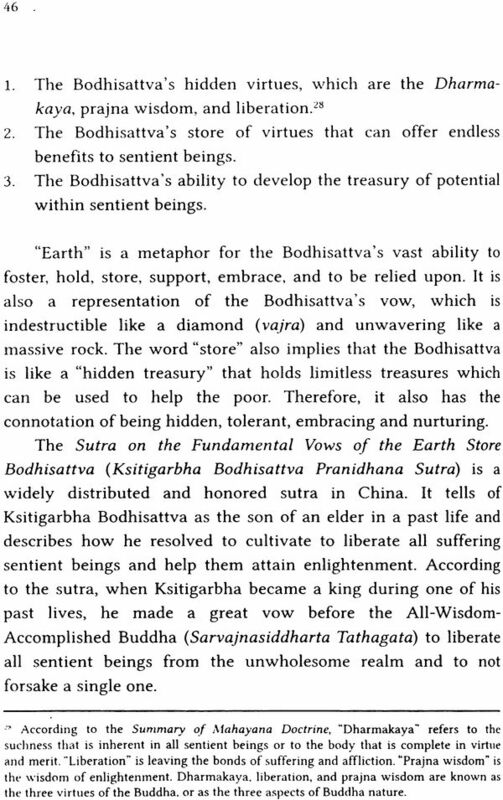 The book also emphasizes the spiritual development of the young in Young Bodhisattvas:” Sudhana, who traveled throughout India, meeting and studying with over fifty spiritual leaders, is an example of Buddhist spiritual study abroad; Yasa, who encountered the Buddha shortly after his Enlightenment and became a follower of the Buddha; Rahula, the Buddha’s only son, who was ordained under the Buddha and became the youngest monastic; Sumaghadi, a young lady of profound wisdom, who attended the Buddha’s Dharma assemblies and was not afraid to speak directly to the Buddha; Bhadda Kapilani, who, though young and beautiful and at one time betrothed to Mahakassyapa, joined him in being ordained by the Buddha; and the Celestial Maiden, who rained flowers on Sariputra, much to his (initial) dismay. The tales bring Buddhism to life, and help the reader see some of the rich traditions and personal accounts that are part of Mahayana Buddhism. The text concludes with three important chapters: “The Characteristics of a Modern Bodhisattva,” which states that modern bodhisattvas must have a cheerful personality, safeguard Buddhist teachings, practice their faith along Mahayana principles, and apply skill in means to liberate sentient being; “Attributes of a Bodhisattva,” which describes how bodhisattvas have the endowment of great roots, possession of great wisdom, faith and conviction in the Great Dharma, Perception of the Great Truth, cultivation of magnanimous acts, endurance of an extremely long period of cultivation, and attainment of Buddhahood; and “The Completion of the Bodhisattva Path,” which describes attainment of the bodhisattva path in the family, society, and the Dharma Realms. Anyone interested in learning about Buddhism will find the combination of basic theoretical framework, practical application, and historical knowledge a useful introduction and overview. Readers who are already Buddhist and are sincere in overview. Readers who are already Buddhist and are sincere in dedicating themselves to the cultivation of the bodhisattva path will find this book compelling. The book provides not just the fundamental principles, but also extensive references to the Buddhist canon, and both the basic principles as well as advanced methods that they can follow.